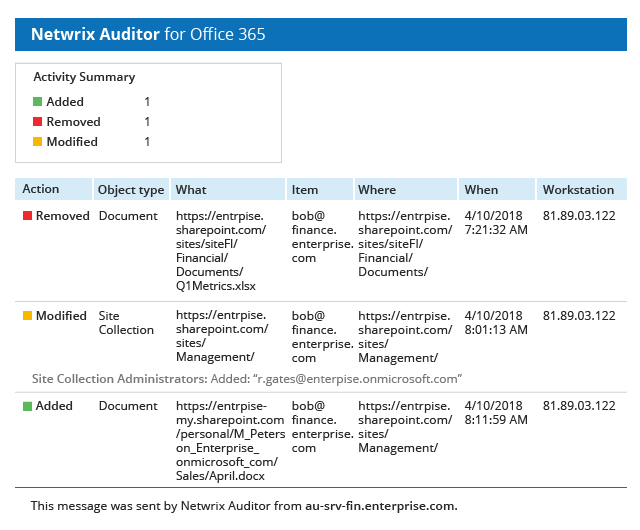 The free edition of Netwrix Auditor for Office 365 delivers visibility into SharePoint Online, OneDrive for Business and Exchange Online systems. Daily activity summary reports sent by this free reporting tool include critical details for each event. These automated reports on Office 365 user activity facilitate routine Office 365 admin review for improved security and compliance. Delivers deep insight into configuration, security and file changes across all your SharePoint Online, OneDrive for Business and Exchange Online systems. Reports on which data users tried to access in SharePoint Online sites and OneDrive for Business, and tracks all non-owner mailbox access attempts in Exchange Online. Reduces usage of Office 365 Admin Center by sending daily email reports on all changes and access events, so you don’t have to spend time switching through endless pages and consoles. Relieves you from extra expenses or painful budget approvals, and will never expire or stop working when you need it. This freeware reports on configuration and file changes in SharePoint Online and OneDrive for Business systems, as well as suspicious attempts to access SharePoint Online lists and documents and OneDrive for Business files. It also reports on Exchange Online configuration changes, and mailbox activities in Exchange Online accounts performed by non-owners. 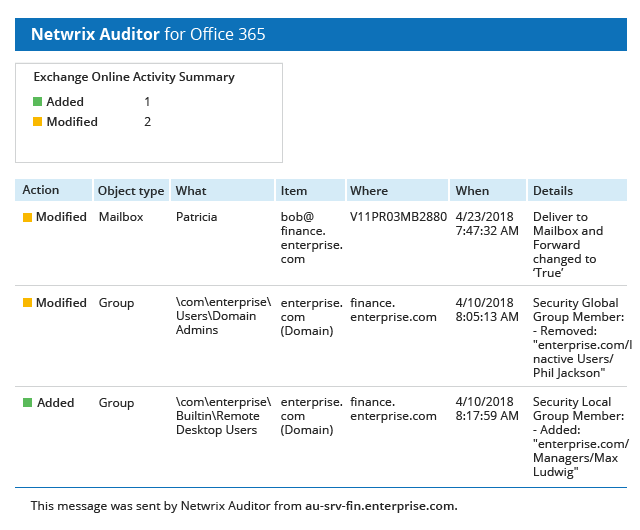 On top of auditing Office 365, the Netwrix Auditor platform also delivers visibility into Azure Active Directory by tracking changes to cloud user accounts and logons to Microsoft cloud services. Plus, if you have a hybrid IT infrastructure, Netwrix Auditor will report on both your cloud-based and on-premises systems in a unified way — giving you a level of visibility and control that Office 365 Security and Compliance Center simply can’t provide. 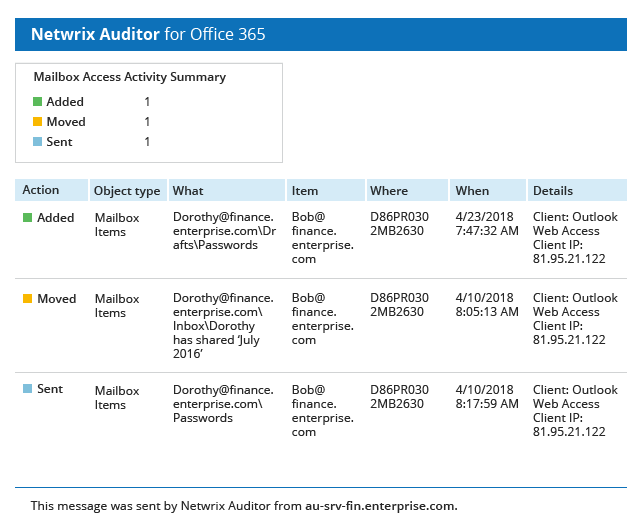 The free edition of Netwrix Auditor for Office 365 is quick to download, and the step-by-step installation process is so clear that you won’t need a manual. Here are the minimum system requirements. Any .NET Framework that goes with your OS: 3.5 SP1, 4.0, 4.5, or 4.